Author Don Beck gets right to the point in his Introduction: “Ever wonder what it would be like to be the CEO of a hot, fast growing social media startup in Silicon Valley?” he asks. 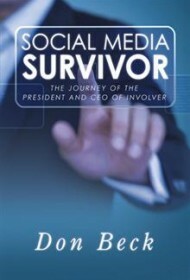 In this intriguing account of his tenure at Social Media Startup Involver, Beck delivers on his promise to take readers behind the scenes. With a background that includes executive positions (although never CEO) at IBM and Adobe, Beck was a well-respected veteran of the high tech industry when approached to become CEO of Involver, a fast-growing social media marketing company. He takes us from his initial consideration of the offer, through the vetting process and his establishment of a corporate direction, and onward to his (unsuccessful) attempts to obtain venture capital funding and finally his decision to sell the company to Oracle. As his story unfolds, readers encounter both a good narrative arc and practical business knowledge. Those who love hard data in their business books will find plenty here, including his initial 90 Day Plan, his criteria for hiring a marketing vice president, and bulleted lists outlining the reasoning behind his decisions and strategic moves. For those more interested in the human element, Beck’s narration of his meeting with venture capital and merger and acquisition firms provides a front row seat into the boardroom. He is also open about his anxieties and doubts as a first time CEO and the need to revise his initial game plan. One can learn as much from Beck’s personal integrity and character in his approach to the book as from his business acumen: He never reveals proprietary information and, when discussing obstacles, never finger points or devolves into self-justification. In sum, this book is highly recommended for business people, not only for its story line and execution, but for its potential use as a case study and the guidance it offers to both first-time and experienced CEOs.